Meet the challenge. Amplify a community with music. Join GOOD March 15-29 by voting for the musical arts proposal with the potential to affect the most social change in a community. GOOD is a multifaceted social change think-tank that simply “gives a damn.” Don’t worry, those are their words, not mine. According to their mission statement, “GOOD is a collaboration of individuals, businesses, and nonprofits pushing the world forward. Since 2006 we’ve been making a magazine, videos, and events for people who give a damn.” (GOOD) Their bedrock supports four platforms: News, The Magazine, Finder, Maker. Recently, the GOOD Maker platform opened its gates to proposals of how the musical arts can improve and amazingly, do good, in a community. All submissions must be received by March 15 noontime. With 3 hours left and counting, 95 ideas are already posted awaiting your vote come the afternoon of March 15. Of course like any great idea, funding is necessary to implement the inspiration into action. GOOD is offering a $2,500 award to the proposal that accrues the most votes. What is special about this modest initiative? Why the focus on music and the community? And where do the two intertwine to foster social change? To start, GOOD in its marketing and social media savvy understands the “how-to” in presenting innovative concepts. By giving equal opportunity to every community member in proposing their dream concept, GOOD is placing the transformation of a neighborhood in the hands of its members. This furthers grassroots activism at the local level, and yet increases awareness at the national level. In fact, this is the type of enthralling, entrepreneurial platform needed in the arts. Though GOOD’s offering is modest, every penny counts in the music non-profit sector where the first budget cuts usually occur. Now, why the focus on music and community? The linking factor comes down to communication. There are two definitions of the word communication. In its most familiar form, communication is understood as the sending and receiving of ideas over a distance in space. 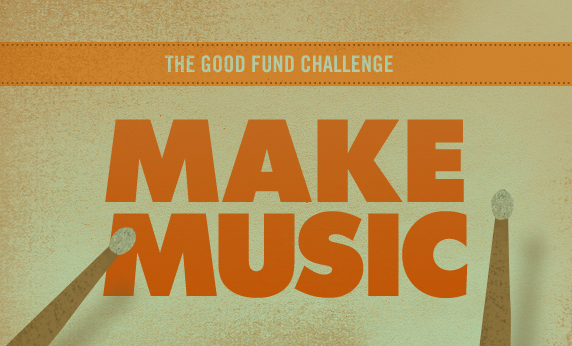 You send a Facebook message to your friend with a link to The GOOD Fund Challenge: Make Music. Your friend receives the Facebook message and responds in a Facebook message with the link to the proposal he or she will vote for. This is a “transmission view” of communication. Another definition of communication is a much older version than the latter. In this definition, communication is defined not by the action of sending and receiving information in space, but rather the sharing of a communal act. This “ritual view” of communication is where music and community meet. Individuals communicate through the medium of music in the self-expression of their multiple narratives. As the audience responds to the extension of this message, the sender and receiver are sharing values and moments of meaningful “sound” together. The sheer potency of this connection is intoxicating and at times life altering. Bolstering a community through the medium of music to improve or support a particular project has the potential of ultimately fostering social change. The remaining question is the rate of its effectiveness, which depends on two factors: the inclusiveness of the musical act and sustainability of the proposal. Inclusiveness of the musical act refers to centering on overarching ideas that people can relate to and yield a parcel of ownership. This concept is based in protest music subculture. The purpose of protest music and collective singing is to build and empower social movements while framing the discourse to include as many constituents in the movement as possible. This tactic has surfaced as a component during the Civil Rights Movement in America, the New Song Movement in Latin America, and most recently during the Arab Spring Movement. “Collective singing reinforces feelings of belonging to a larger community, something larger than themselves and empowers activists to believe that they can ultimately affect change.” (Brooks 65) The GOOD: Make Music proposals are not necessarily meant to protest a certain issue. The purpose is to mobilize a community to support a particular neighborhood or grassroots project. Inspiration fostered by social activism does not only come from the initial act, but from its continued cultivation of relationships within a community. Without a sustainable project, initial community support may dwindle in face of stagnant amounts of change and lack of interactive, transformative elements. After all, empowerment does not occur over night even in the most promising of interventions. Voting for the best suited GOOD: Make Music proposal will not be an easy choice. In arriving to a decision, keep in mind how well the project you choose can foster social change in a community, which constituents will be empowered, and if the overall proposal is sustainable. By voting for a particular proposal, you amplify a cause. Perhaps you will contribute to a child’s excitement in strumming the first chord on his or her own instrument, to an open-mic/jam session in a city park or theatre space, to music interventions in healthcare or inter-religious relations, etc. Meet the challenge. Amplify a community with music. FYI: Luckily for us, we do not need to bother with nationally televised debates to make this vote! 1. Brooks, Jeneve R. “”Peace, Salaam, Shalom”: Functions of Collective Singing in U.S. Peace Activism.” Music & Arts in Action 2.2 (2010): 56-71. Music & Arts in Action. University of Exeter, 2010. Web. 7 Oct. 2011. <http://musicandartsinaction.net/index.php/maia/article/view/antiwarsongs&gt;. 2. Carey, James. Communication as Culture: Essays on Media and Society. New York: Routledge, 1989. 3. “What Is Good.” GOOD. GOOD Worldwide, LLC. Web. 12 Mar. 2012. <http://www.good.is/company&gt;.